in 1998. FX traders were singing a similar tune this week, although their lyrics may have contained expletives. Bank of Canada Governor Stephen Poloz got the ball rolling on Wednesday. Many FX traders believed the tone to the BoC statement and press conference leaned toward dovish because of concerns that “export growth and investment were held back by competitiveness challenges and trade uncertainty". USDCAD, which had probed support at 1.2550, roared higher and touched 1.2682 on Friday morning in Europe. Former BoC governor and current Bank of England Governor Mark Carney may have read the text of the BoC policy statement and Monetary Policy Report. On Thursday, April 19, he blindsided sterling traders when he appeared to downplay the chances for a rate increase in May. GBPUSD collapsed from 1.4248 to 1.4038 on the news. Arguably, the USDCAD rally and the GBPUSD plunge were more a factor of positioning, rather than a wholesale shift in medium-term sentiment. Both central bankers merely stated the obvious; that ongoing trade issues have played a role in lower investments. Central bankers are paid to see the cloud while others focus on the silver lining. Poloz and Carney reiterated that interest rates were going higher, suggesting that both currency moves may be buying opportunities. The USDCAD downtrend is intact while prices are below the 1.2720-30 area. A move below intraday support at 1.2660 would suggest a period of 1.2530-1.2730 consolidation. It is a short week for Australians and New Zealander s who have Wednesday, April 25, off for ANZAC Day. European Central Bank meeting Thursday, April 26. FX traders will be looking for guidance on the end of QE. Monday is purchasing managers index day with reports from Japan, Germany, the Eurozone, and the US. Eurozone data may continue the recent trend of soft economic reports. 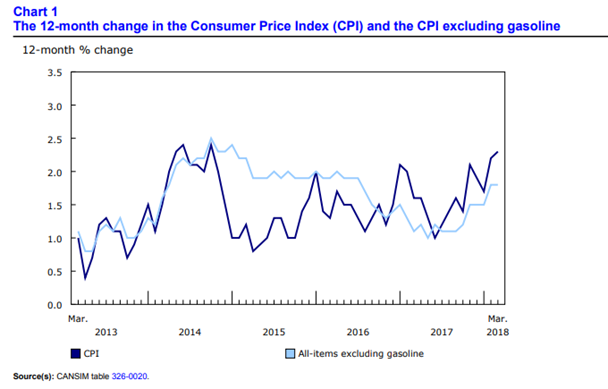 Tuesday: Australia Q1 CPI. The Reserve Bank of Australia is on hold for the foreseeable future, suggesting the impact from this data, if any, will be fleeting. Friday. It may be a busy Asia session with New Zealand Ttade data, Australia PPI and Japan CPI, employment report, large retailers sales and industrial production data ahead of the Bank of Japan meeting. US Q1 GDP (Forecast 2.3% vs previous 2.9%) is thought to be affected by poor weather and late tax refunds. The US, France, and the UK fired missiles at three Syrian targets on the weekend which could have led to a nasty start to trading. It didn’t happen. Monday: Asia FX markets were relatively quiet and rangebound. The underwhelming response by Russia to the Syria attack (they called an emergency NATO Security Council meeting) sparked a whiff of positive market sentiment. However, a lack economic news in Europe and Asia limited currency moves. The US data, including retail sales, was mildly disappointing and combined with a more upbeat tone to global trade, led to broad but limited US dollar selling. The greenback finished the session with losses across the board compared to Friday’s closing levels. Tuesday: FX markets were choppy but rangebound in Asia. Things changed in Europe after a couple of weak economic reports. Sterling got spanked after the UK employment report was not as robust as expected. GBPUSD dropped from 1.4374 to 1.4307 on the news. EURUSD fell to 1.2365 from 1.2411 when German and Eurozone ZEW sentiment surveys were below forecasts. USDCHF rallied following weekend comments by the Swiss National Bank Chair Jordan. Better-than-expected, but second-tier USD data added to US dollar demand but briefly. The greenback finished the day on a mixed note. Wall Street rallied and closed with gains. Wednesday: The antipodean currencies traded sideways in Asia while USDJPY had a bit of a pop to it rising from 107.00-107.40. The range gradually narrowed until the New York close. Japanese Trade data didn’t have any impact. Sterling got clobbered in Europe after a series of weak UK economic reports including weaker than expected inflation data. GBPUSD dropped from 1.4313 to 1.4174. EURUSD dropped, but not as dramatically, after soft German and Eurozone ZEW reports. Both currency pairs rebounded in New York, but the rally was shallow. The Bank of Canada left rates unchanged and issued what some believe was a dovish statement. USDCAD soared from 1.2550 to 1.2557. Oil prices climbed from the Asia low of $66.58 to $68.88. A decline in US crude inventories and a report that Saudi Arabia wanted to see oil at $100/barrel powered the move. Thursday. FX markets in Asia and Europe were sleepy, although New Zealand inflation data and the Australian employment data caused a brief stir. USDJPY continued to look for direction while drifting in a 107.00-50 range. There wasn’t any top-tier Eurozone data, which left EURUSD rangebound. A disappointing UK retail sales report led to a short-lived bout of GBPUSD weakness, as poor weather may have hurt the results. The US dollar roared to life in New York. Falling commodity prices and the outlook for higher US rates drove commodity prices lower. 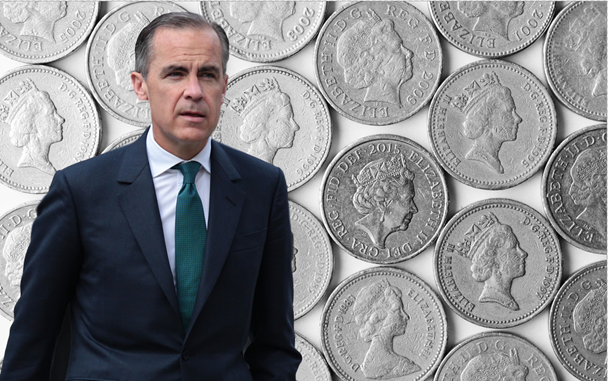 Sterling crashed when Bank of England Governor Mark Carney appeared to dismiss the prospect of a May rate hike. Oil prices gave back earlier gains, and Wall Street closed with small losses. Friday: USDJPY finally cracked above resistance at 107.50 helped by firm Treasury yields and broad US dollar strength. The US dollar closed the week with strong gains as traders turn their focus to the US economic growth and higher interest rate outlook.